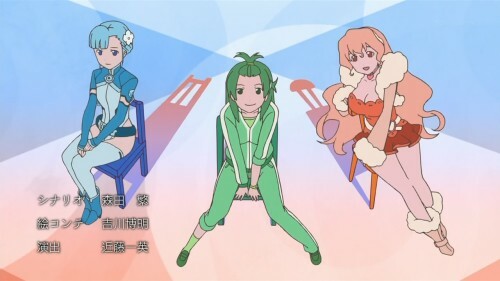 One of my favorite moments in the anime Lagrange: The Flower of Rin-ne is when we find out the truth about the Jersey Club, the seemingly do-anything, help-anyone group that the main character Kyouno Madoka leads. What we find out is that, whether or not Madoka realizes it, the club was created from a lie. In a time when a young Madoka was suffering from a traumatic event in her life, a local high schooler who happened to be jogging at the time created the idea of the Jersey Club on the spot, facetiously claiming that her exercise sweats were some kind of uniform in order to cheer Madoka up. The story of the Jersey Club, then, is one about how lies became truth, as Madoka took the kindness and altruism shown to her, and actually transformed it into a life philosophy. By the end of the series, it’s become almost literally a universal philosophy. This idea of lies transforming into the truth through honesty and determination feels to me like a recurring theme in Japanese visual media. Fate/Stay Night‘s “Unlimited Blade Works” arc famously makes the claim that there’s no reason a copy has to be inferior to the original. Even knowing the origins of something, even when aware that something is a sham, it’s as if sincerity is the key ingredient to bend reality and perception. It reminds me also of something I heard recently, which is that a sequel to Harper Lee’s To Kill a Mockingbird was published, which reveals Atticus Finch, the noble lawyer who defends a black man in a racist town, is actually revealed to be quite racist himself. The main character of the original book, Scout, turns out to have been looking at her father from the perspective of a child, only to realize his limitation as she grows into adulthood. It’s a controversial sequel, which was actually the prototype for To Kill a Mockingbird, but here we see too a “lie” becoming beneficial. Scout takes the ideals she sees from Atticus’s message and way of life, and transforms it into something even greater than the person himself. Granted, this “bending” of reality is not necessarily without its problems. This is evidenced by the manipulation created by “fake news,” and the skewing of television news audiences, where viewers will gravitate towards the channels that cater to their beliefs almost regardless of the veracity of their reporting. The vital factor in determining whether an action is “good” or “bad” comes from what we’re seeing as “reality.” Is reality a construction of assumed cultural standards that resist change because of inertia? Or is it the foundation of truth that risks being chipped away by inaccuracies meant to exploit biases? The transformation of lies into truth can be heartfelt or diabolical, a risky double-edged sword that needs conscious tempering by both audiences and creators alike. This entry was posted in anime, thought exercise, trends and tagged fate/stay night, lagrange: the flower of rin-ne, rinne no lagrange. Bookmark the permalink.